The Value Web recently completed its first engagement with the State of Gujarat in India. The eight-month contract culminated in January at Vibrant Gujarat 2017 Global Summit, where we served as Innovation Partner. The Summit is held every other January in the Mahatma Mandir in Ghandhinagar. It draws more than 30,000 attendees from Gujarat and around the world, making it India’s biggest and most successful investment summit. Founded by Narendra Modi in 2003, the Summit has helped Gujarat become a global business hub and the number one industrial state in India. Create an ecosystem of multi-sector, multi-stakeholder collaborative engagement that will help transform the Summit into a platform for social innovation. Enhance the participant experience through real-time graphic recording of Summit presentations and events. The Value Web team consisted of 12 facilitators and visual practitioners. Included among our team were four Indian citizens who are learning our facilitation approach, part of an effort to establish a native community of practice around The Value Web methodology in India. The team designed and facilitated three Action Seminars during the Summit. We used the name Action Seminar to differentiate these sessions from the Theme Seminars held at past Summits (as well as the current one). Theme Seminars consist of speakers and panelists presenting their ideas to a large audience. Our goal with the Action Seminars was to transform seminar attendees from a passive audience into collaborative actors by engaging them in solution design. Inclusive Growth: Agriculture in the 21st Century. Propose solutions to double farmer incomes—inclusively, sustainably, and equitably while bringing dignity and esteem to farming. Innovation, Startups, and Entrepreneurship. 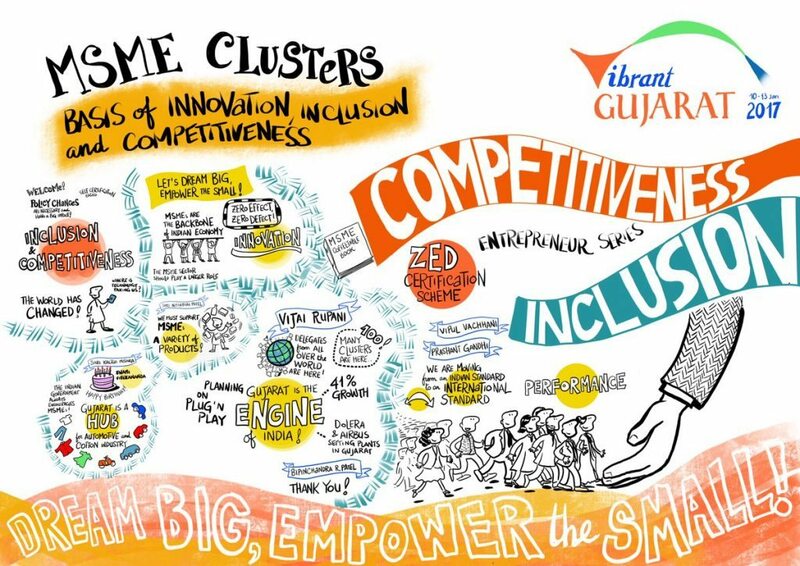 Propose ways government can enable and facilitate an ecosystem that supports startups and innovation so that Gujarat becomes the place entrepreneurs go to turn ideas into success. Smart & Livable Cities. Propose solutions that make our cities smarter, more livable, affordable, inclusive, and resilient. Each seminar was three hours long and involved 100 to 120 participants, who were curated to represent a cross-section of the ecosystem surrounding the topic at hand. For example, the Inclusive Growth Action Seminar included some forty mostly smallhold farmers, who drove up to 500 kilometers to participate in the session. Joining them in the group were government officials, subject matter specialists, and industrialists representing twelve different agricultural sectors. A total of 35 proposed solutions came out of the Action Seminars. These will now be evaluated and prioritized, with the top ones carried forward as policies and programs. The Value Web also designed and facilitated a fourth, unplanned “pop-up” session for Dr. Jayanti Ravi, the Principal Secretary and Commissioner of Rural Development in Gujarat. Inspired by what she saw in the Action Seminar space, Dr. Ravi asked if The Value Web could help launch a transformation effort converging five separate programs serving rural villages. She brought together sixty plus representatives from her staff and the affected programs into the Action Seminar Hall, where they designed action plans at the Ground, Block, and District levels. This session was The Value Web’s gift to the villages of Gujarat, and we hope to return to Gujarat in the future to further assist in this important work. The graphic recording component of our work was delivered by three of The Value Web’s world-class visual practitioners—Jayce Lee, Lucia Fabiani, and Peter Durand. They created more than twenty graphic recording murals at Summit events. Their work created such a sensation that Summit officials asked for all of the murals to be brought into the Main Hall for prominent display at the Summit’s formal closing ceremony. The Value Web’s visual practitioners were also the subject of a front-page story in the City Times, a Gujarati newspaper with a circulation of more than one million readers. We are confident their amazing work has laid the groundwork for more ambitious forms of visual practice at future Summits. You can download a PDF documenting the use of graphic facilitation at the summit here (courtesy of Peter Durand).